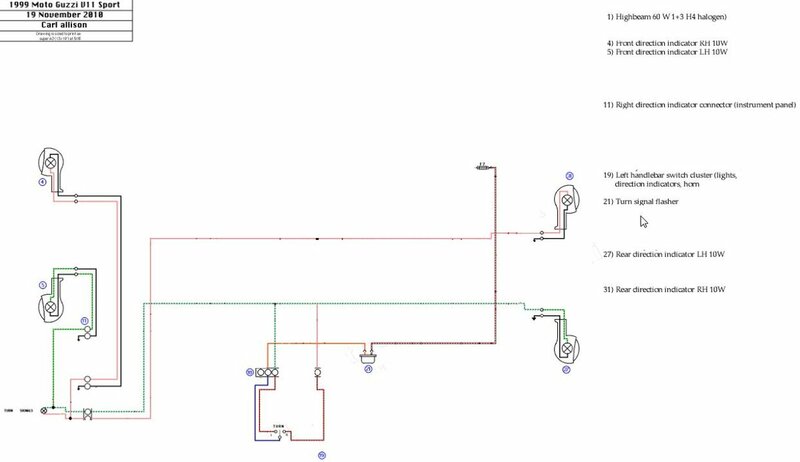 if this is the wirediagram of a V11, can anybody explane why if i have blinkers running lights (so they need no relais), and i replace the controle light with a LED (1,3 M Ohm), all blinkers (L+R) start blinking when ever i activate L of R.
(the relais is replaced by a wire). 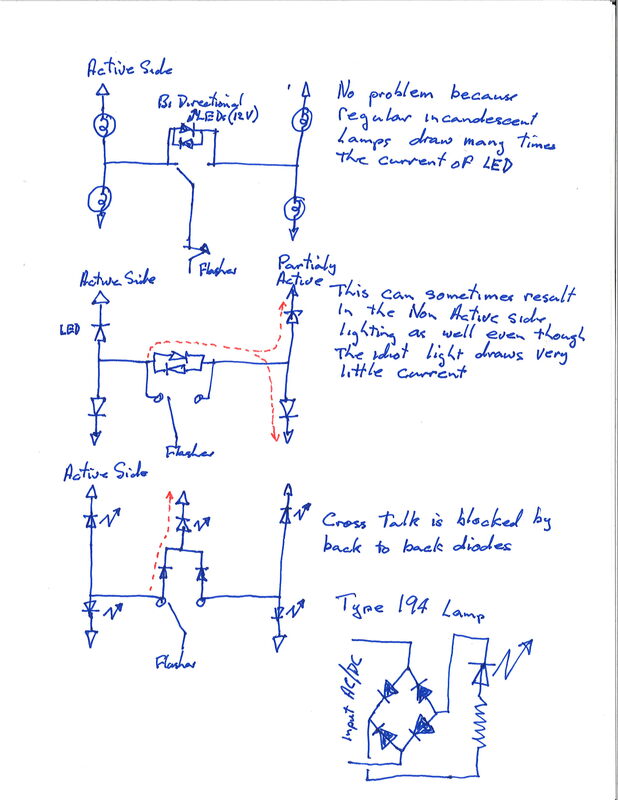 Yes, the resistance of the LED are not great enough for the flasher to function correctly. You may have results changing to an electronic "flasher" unit designed for the task. Others have added resistors to the circuit. I found that only using the front signal units, only, lets my Sport function normally while retaining the rear incandescent bulbs. Docc is right (again). You need an electronic flasher  which will flash the indicator lights irrespective of current draw from the lamps. I did this, and found another problem. The instrument panel  turn signal light is connected to both left & right indicator light circuits, so if you have all four indicators fitted with LED lamps, all four lamps will flash when you indicate left or right turn. That  indicator provides a path to ground via the side opposite the side you selected. The fix is to replace the little incandescent bulb in the  panel with a facing pair of LEDS, with a common ground. Until I follow my own advice, I have only LEDs in the front indicators, same as Docc's bike. When i mesure the resistance, the resistance is both ways 1,3 M Ohm. But i cheched today there’ s a different between the way i stik ik the led. if i thun the ather way, both te blinkers are working. if i thun the ather way, both te blinkers are working both again. I'm not sure if you have solved this yet or not. I have some pictures of that if anyone is interested, because LEDs last forever I throw away the sockets and glue lamps in place. BTW all 12 Volt LEDs have a resistor or current limiter in series, we just don't bother showing it. Headlights for instance only need about 9 Volts, the rest is gravy, it gets no brighter.